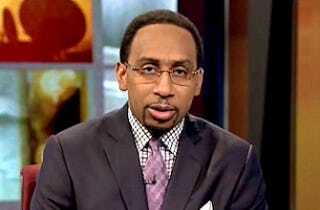 It only took a weekend for cooler heads to prevail and for Stephen A. Smith to back away from Twitter. On Monday the normally brash and cocky Smith issued a heartfelt two-minute apology for his controversial statements regarding domestic violence and Ray Rice on ESPN2's First Take. During the discussion on last Friday's show about Rice's two-game suspension for reportedly knocking his then-fiancée unconscious, Smith implied that somehow women played a role in "provoking" domestic violence. Instead of backing away from his position on Friday afternoon, Smith took to Twitter to defend earlier statements. During a taped segment at the top of Monday's First Take, however, a somber and subdued Smith apologized. "On Friday, speaking right here on First Take on the subject of domestic violence, I made what can only amount to the most egregious error of my career," Smith said. "My words came across that it is somehow a woman's fault," he said. "This was not my intent. It is not what I was trying to say. Yet the failure to clearly articulate something different lies squarely on my shoulders."